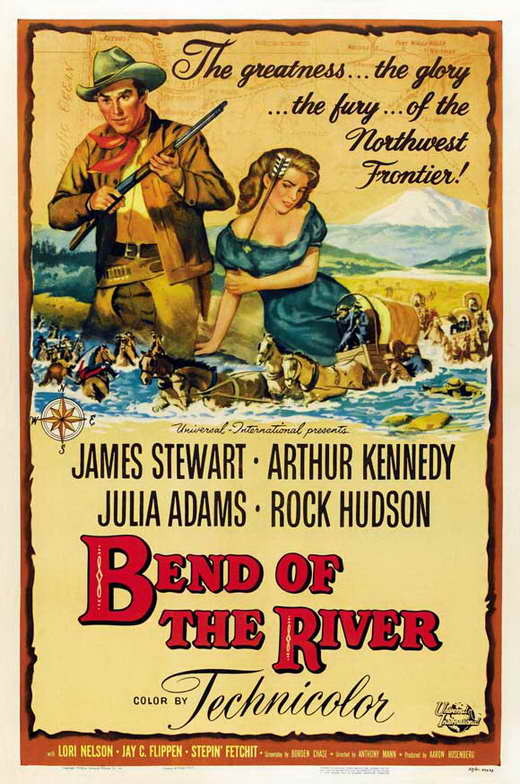 A former border raider (James Stewart) helps a group of settlers — including two beautiful sisters (Julia Adams and Lori Nelson) — cross safely into Oregon while rescuing a vigilante (Arthur Kennedy) who then joins their troupe. 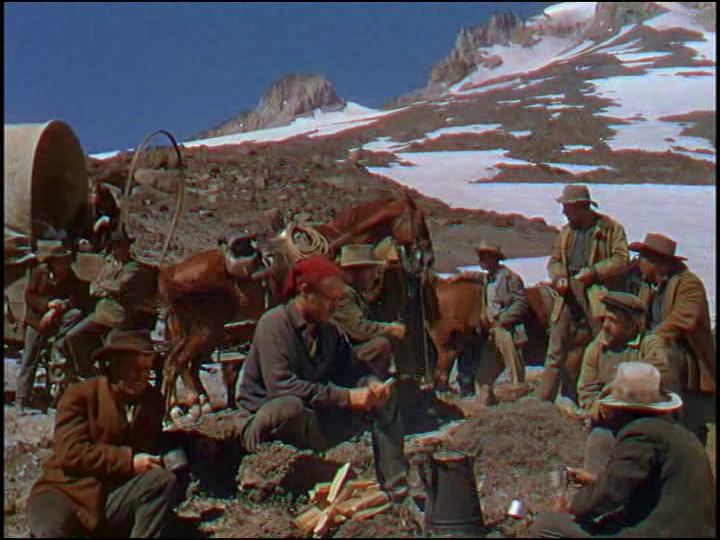 When food supplies become scarce due to a gold rush in Portland, Stewart must try to secure their safe shipment back to the settlers — but will Kennedy be lured by the exorbitant prices being offered by miners? 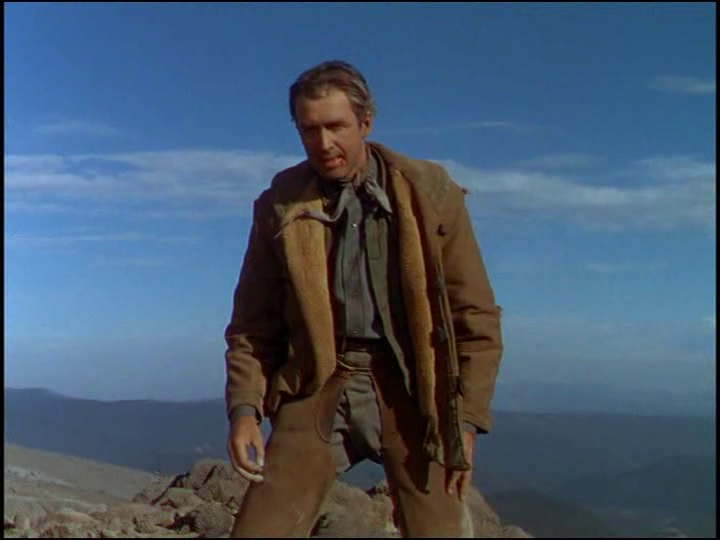 Peary notes that this “exciting” “second of five westerns Anthony Mann made with James Stewart” centers, “like most Mann westerners”, on men who “can’t escape [their] past”, and “how violent men choose to lead their lives now that the West is becoming civilized”. He writes that the “script by Borden Chase is first-rate”, with “the dialogue between Stewart and Kennedy… particularly strong”, conveying that “each knows what the other is thinking at all times”. Indeed, Stewart and Kennedy make for a fascinating pair of (anti-)heros, with each demonstrating the better or worse part of their natures when confronted by temptation. Tension in the storyline is near-constant, given the confluence of naturally rugged terrain, limited supplies, a small handful of beautiful women, and gold fever infesting men’s hearts and minds. When basic supplies can be sold for 100 times their “natural” cost, will greed outweigh basic decency and respect for human life? That dilemma drives the narrative, which takes place within “excellent cinematography of the beautiful landscape” by Irving Glassberg. Yes, as another fine outing between Mann and Stewart. That’s too funny that you just reviewed these two Mann/Stewart movies (two of the best, in my opinion). My wife got me Jeanine Basinger’s updated book that she wrote in ’79 on Anthony Mann for Christmas and I’ve gotten through a couple of chapters. From what I’ve read so far, she’s a good writer, by the way. Anyway, I love this Mann/Stewart outing. In fact, it’s probably my favorite of all of them. The duality of Stewart and Kennedy and how Kennedy is a kind of proxy for Stewart’s shady past weaves nicely throughout the movie, amping up the tension. Is there any redemption for the sins of Stewart’s (the) past? Can someone turn for the better? The cinematography is tops, it really is a knock-out to look at. In fact, there are moments where the gorgeous photography is almost breathtaking, particularly with the mountain landscape so perfectly balanced in the background. As Basinger put it: “From the very beginning of his career, he made films that were inherently cinematic.” [p.3] You need look no further than here to see that. And each scene is so carefully crafted, it is virtuosic visual storytelling. When you can find that in the movies, it deserves to be praised. As a Mann-related side note, I recently found a well-done noir he directed (uncredited) in ’48 called He Walked By Night with a very young Richard Basehart and Scott Brady, which is streamable on Amazon Prime for free. As with all B movies, it’s a quick 78/79 minute viewing. But the same thing, a strong recognizable visual style, sharp John Alton cinematography, tense pacing… and pre-Dragnet Jack Webb as a forensics guy. Very solid effort. Yes, quite a coincidence! I was just thinking about purchasing Basinger’s book a couple of days ago myself. I’d like to learn more about Mann. First viewing. A once-must, at least. Another satisfying Mann-Stewart collaboration. I wouldn’t agree that “[t]ension in the storyline is near-constant”. In fact, a very (very) slight drawback is that it takes awhile for this flick to get into high-gear (roughly 30 minutes!). I would imagine that most viewers of westerns – and Mann fans, in particular – won’t mind the time taken for exposition and character development, but a slow first 30 minutes is still a large chunk of time in a 90-minute film. Once the first moment of genuine conflict arrives, things again slow down a bit – however, the film’s mid-section is a fine set-up for what’s to come… and the final, complicated 30 minutes more than makes up for the time it takes to get there. There’s considerable upset as the story progresses (while viewers are possibly simultaneously considering just how tough it could have been to make this film, what with the terrain and all). Mixed in with the unexpected turns is an element of split loyalty that has remained ill-defined… until it shows its true color. I wondered about that element a bit… then realized that it’s ultimately not as far-fetched a switch as some might think. It falls under ‘duplicity’ – which can be very unsettling (to say the least) to deal with.